Urushi pens seem to have a bit of prestige and prominence all their own, and tend to have a price tag that says "prestige". Many of the urushi pens on the market are easily out of most people's reasonable budgets, but apparently that may not need to be the case. You've likely seen around the pen blog circuit through social media and likely now many full reviews discussing a new Kickstarter campaign by a Japanese pen company called Wancher. What they've set out to create is a more affordable full-ebonite, urushi fountain pen line that fits a bit more in the budget but without sacrificing the experience. Prior to being approached to review one of their new pens I was unaware of Wancher's existence, but they've been around for over 30 years. Upon looking at their offerings they seem to share some models with a few brands (like the Taccia Timeless), but these new urushi pens seem all their own. Ebonite? Urushi? What are you talking about? Well, let's talk a little history on both before going too far. Ebonite: this awesome material has been around for a little while (mid 1800's) and is made by the process of vulcanizing natural rubber and mixing it with some other elements to give it a stiff and workable structure. Although similar in feel to what we might think of as a plastic, ebonite is more durable and has a naturally softer feel. Urushi: a truly amazing (in my opinion) and very traditional, ancient even, process of applying numerous coats of a natural lacquer to an object to give it a lovely shine, but also protection. A finish like this can take months to complete. What is so interesting about the use of ebonite is that it is rarely done these days. 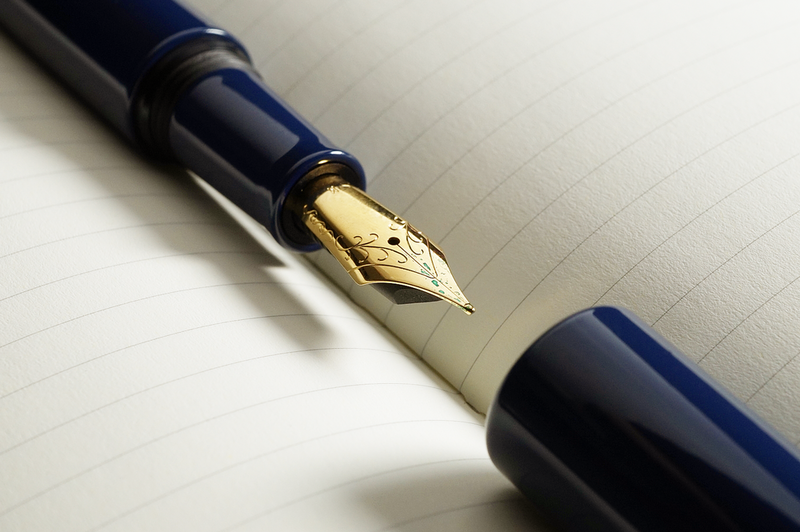 In the early days of fountain pens it was a commonly used material, but with the invention of various new plastics/acrylics it fell out of preference due to its difficulty to work with in comparison. An urushi pen has been on my radar to purchase for awhile, but I've never officially pulled the trigger. I've had the pleasure of using some on loan, and it was nice to get a closer look at another model to gather more opinions. Wancher was kind enough to send me their True Urushi fountain pen in Urushi Blue on loan (as these were prototypes) for review. The first thing that stands out about an ebonite pen like this is the weight. They feel so light in comparison to the bulky metal pens I carry most often and love. I would consider this pen to be on the larger side at around 6" capped, but only weighs in at 0.8oz fully inked with an international long cartridge. Although it is light and airy, it doesn't feel fragile which is an odd sensation. The look of the pen is very minimal and monochromatic, but the urushi finish adds a very refined appeal that has a plain sort of beauty to it. It isn't flashy, but it's plainness is what makes it stand out and I like that. All too often pen makers feel a need to add rings, bands, jewels, or other ornamentation that can make it appear more elegant than it really is. Pens like these don't make a fuss and let you decide for yourself. The color of the urushi finish is a more solid blue as it is what they are referring to as a "true urushi". In different lighting it can transition to a lighter navy, down to a dark blue. I imagine when most people think of urushi pens they see in their mind the pens that have a bit of contrast, almost shading around the edges where the lacquer seems thinner in spots. This is actually a different style of urushi called Tamenuri, which Wancher has also included as an option in their Kickstarter in red (which is very pretty). That all being said, the true urushi blue is still lovely although not quite as dramatic of vivid as the red version. Depending upon your personality, I'm sure color choice will definitely come into play. The coating of the pen is polished to a smooth and glossy finish which reflects the light, but isn't quite a mirror-type gloss. Think close to a piano black finish, but blue. Being so glossy, fingerprints and the oils of your hands are attracted to the pen which can overtime give it a bit of a slick feel which made me want to wipe it down every so often. I traditionally don't have very sweaty hands (to much info?... ), but wanted to bring this up as the feel and texture was noticeable over time while writing. To speak to the quality of the finish, the application is pretty impeccable, namely, there isn't a flaw to be found. There are a few spots on the pen where the urushi stops and the ebonite reappears like on the inner threads of the cap and the treading at the section, but the lines are crisp and perfect. Pretty impressive all done by hand. The cap does not post which is probably traditional in cigar-style urushi pens like this, but something to consider. In hand while writing the pen is large, but due to the low weight it isn't cumbersome and is actually extremely comfortable. I notice my grip changed some due to the diameter of the pen. I tend to be a very traditional "triangle" grip writer, but I find my thumb drifting back behind the threads rather than trying to reach down being a bit of a stretch if that makes sense. It did create a shifted writing experience, but for me didn't bother my lettering. I could see this as a potential issue for some though if you run into the same grip situation. The prototype was fitted with a gold-plated #6 Jowo steel nib, but in the Kickstarter the True Urushi models come with a 14k or 18k nib which seems to be a requirement. If I were to choose I'd have paired this particular pen with a steel colored (or rhodium plated) nib due to the color. Jowo is one of the more trusted nib makers for custom pens and the medium wrote wet and smooth, maybe even a hint on the glassy side. My opinion of this pen is that I actually really love it. Pens like this are a bit outside of my standard selection, but it makes me want to branch out and have a few like this in my collection. I wouldn't see myself becoming an urushi pen enthusiast, but there is a refinement, almost delicate nature to using one that I don't get from my other writing instruments. As mentioned above, Wancher set out to create a beautiful urushi pen that was more reasonably priced and I would say they've succeeded in doing so if the fit and finish of the production models are anything like the prototype. These pens come in at around $350-400 US right now on the Kickstarter which is about 30-40% lower than how much you'd pay for other popular urushi pens. In a way, Wancher is setting out to streamline the urushi pen market a bit by offering a high quality product, but with limited options (at least for now). If there is one potential downside to going with one of these pens it would be that you miss out on the customization process that often comes with getting an urushi pen, but the price difference may be worth the tradeoff. Special thanks to Wancher for sending the prototype for review.